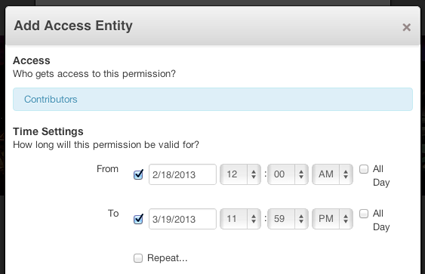 The controls in the Time Settings section allow the selected permission to be valid only during a specified time frame. For example, it may be desired for one group of users to only have access to edit a page during certain hours of the day, or even for a period of several days. Then set the time period during which you'd like the permission to begin and end. Setting an end point is optional. 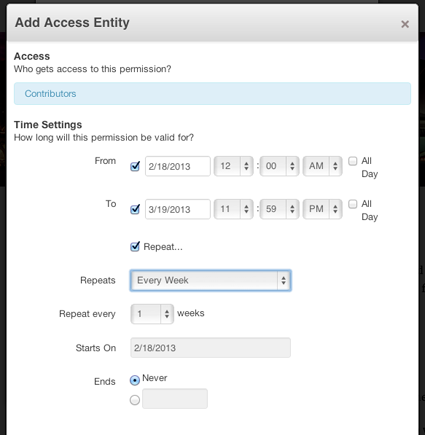 Timed permissions can also be set to repeat the timed access setting every day, week or month. Perhaps you would like to prevent a user or group from making edits during a critical site backup period, for example, between 12am and 1am on Tuesdays. Click the Select dropdown and choose an entity, such as a user or group. In this example, all users will now be unable to make changes to the current page between 12am and 1am on Tuesdays, repeating indefinitely.